Car Free Vancouver: YES or NO? Hey all, so...did Car Free Vancouver Day go off OR WHAT?! We had 125,000 people out partying in the streets...with 400+ volunteers...and a few cut-rate traffic cops...zero "security"...and NO incidents to speak of. The media coverage was fantastic, and it looks like the experiment results are in...Vancouver is ready and begging for car-free festivals, car-free days, and car-free streets. Other cities all over Canada, the US and the world already have it happening...let's kick it up! BUT...to make this happen...City Hall needs to hear from YOU! The event organizers will soon be meeting with folks at City Hall to do a debrief, iron out the bugs, and talk about taking the experiment to the next level. So far, the only people who have contacted the City are the complainers...and they are few, but they are loud! Car Free Vancouver Day needs your support, and our allies at the City need to hear your voice. Please take a moment to write a BRIEF note to City Hall, telling them why you loved Car Free Vancouver Day, and what you want to see happen next. These folks are here to help us, and they have been hugely helpful to us all along the way, so please be positive, grateful, and encouraging. Oh, and...don't forget...with the City elections coming down in November...do grab every opportunity to ask candidates where they stand on Burrard Bridge lane re-allocation, transit, pedestrian and bicycle priority, opposing Gateway, car-free days, and car-free streets. We have so much power, let's use it NOW. Huge thanks to all of you for making this dream real! Shout out to all who came to Brad's on Friday night to the "Gateway to What?" party under the solstice moon, to celebrate the turning of the tides...I'm still buzzing from it! the dancefloor, and the Mexican Wrestlers (Greenwashing Gordo vs. Farmer Brad...don't take that golden handshake Brad! ), and the Wilderness Committee (esp. Ben West) for bringing it all together, and realizing the importance of the party to raise spirits and light the flame. Many S.of Fraser neighbours met each other for the first time, and found out about exactly what SFPR would mean for their community. This was a very powerful night, and it is clear that Brad's place will not go down without a fight (and a few more rockin' parties). Chris Carlsson Tonight at Spartacus! Chris Carlsson, an originator of the first San Francisco Commute Clot/Critical Mass in 1992 and a radical author/instigator, will be at Spartacus tonight! This is from 7-10pm. Spartacus is at 684 East Hastings. 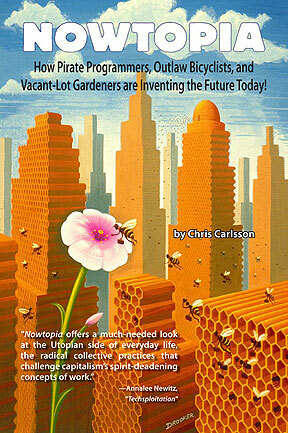 He is touring his new book Nowtopia. You should go! Chris is always inspiring and thought provoking with his humble brand of radical thinking. He's just come from the Portland, OR, Towards Carfree Cities 8 conference. He's also in town to experience the Vancouver Critical Mass for the first time - at the June Massive, tommorrow (this Friday)! 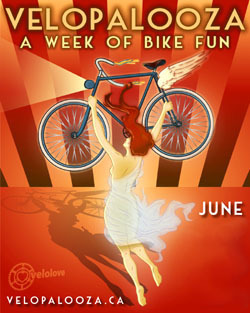 One of the biggest ride and rolls of the year, and possibly the largest ever bike ride to hit the streets of Vancouver, the June Critical Mass Ride closes out this year's Bike Month. Join fellow bicyclists, skaters, and bladers for this leisurely and spirited ride and roll through the streets of Vancouver. Meet at the Vancouver Art Gallery on the Georgia Street side between 5:00 and 5:30 p.m. -- and roll and ride at 6:00 p.m. The ride is on rain or shine. Decorated bicycles, trailers, costumes, signs, flags, noisemakers, gettoblasters, sound systems, drums, and wildly modified bicycles are all highly encouraged. After the ride is a BBQ starting at 8:00 p.m with an after party starting 9:00 p.m. at the ANZA Club, 3 West 8th at the Ontario Bike Route. The ride sticks together for safety and fun. If you are at the front of the ride, stop if you are approaching a red light. But continue as a group if the lights change red while passing though an intersection. Avoid on coming traffic. If you're at the front, please don't speed ahead or take narrow roadways or paths. It stretches the ride out and makes life harder for corkers and other riders. If the mass has thinned out or has broken into more than one group, the front should wait at green lights for the group to "mass up". The ride is a celebration (not a party). Take absolute responsibility for your actions and show motorists a better way to travel. A way which is more equitable, efficient, fun and socially responsible than the car. There's no need to be unfriendly or argue with motorists -- our sheer numbers tell the story. Look after each other, speak up, and ride with confidence. Do you have a bike and like riding it at night? 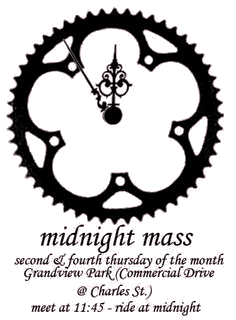 Dig up some bike lights and join the ride the night before Critical Mass! VeloFusion! & Post Critical Mass BBQ! $5 if you arrive with Critical Mass. $10 otherwise. This month is a fundraiser for the Students for a Democratic Society. Y'all may have seen the footage circulating of these folks getting a good pounding from the local authorities. Quite something, really. Come give these folks a good raising yerself. Car-Free Vancouver Day, this Sunday June 15 (Fathers Day), will feature FOUR simultaneous car-free festivals. Come out and play, and help change EVERYTHING! We are expecting over 100,000 people to come out to party in streets, and let the world know that Vancouver is ready for car-free days, car-free streets, and car-free districts. Other cities in Canada and around the world are doing it. It's high time for Vancouver to catch the wave, and join the car-free revolution. all-bassoon orchestra, and much more madness.This event is 100% volunteer organized and produced. We encourage everyone to come out and contribute their gifts today...for tha love, not for tha bux! All Fests will feature Bike Valet Parking. Ride, walk, skate or transit from Fest to Fest -- but don't drive, parking will be crazy! And YES Main Street, Commercial Drive and West End still need VOLUNTEERS!! Be a superhero, person a barricade (or teardown, setup, infobooth, photography, etc. for only a couple of hours or a chore or two and you'll get treated like a rockstar, and invited to the very special Work Less Party Afterparty...DO IT NOW!...email info@$@carfreevancouver . *org and tell us what crew you want to join. Or just show up at an Info Table or Tent on the day-of and offer to lend a hand. Make it your party, because...it is! Thanks to all of you for making this dream come true. p.s...special note from Carmen, delete in forwards as you wish...I know this is tricky, but if you are a member of Vision Vancouver, try to drop by the Croation Cultural Center at 3250 Commercial Drive (16th and Commercial Drive) between 8am and 5pm to cast your vote in the Mayoral nomination race. If you're on a bike it's less than 10 minutes from the party, so you should be able to get there, vote, and be back on the Drive within half an hour. It's a very tight race. I am supporting Gregor Robertson and will be trying my best to get down there and cast my vote. I know that if Gregor wasn't trying to get elected, he'd be out there with us partying for car-free streets. >>Thanks in advance for your help. Feel free to forward to others. Naked Cyclists Take to the Streets! Body painting and performances will take place before the ride. Arrive between 12 Noon and 2:00pm to catch some of the action and some of the paint! A picnic following the ride will be hosted by niftynude.org. The ride, pre and post-ride activities are all free. great slogan "live free or drive"
I was fortunate, along with Haley, to be able to go the the 2006 conference in Bogota, Columbia and it was really inspiring to see all the international perspectives on this and how so much progress is being made outside of North America that we can learn so much from. Last year it was in Istanbul. This will be the first conference in North America! And Portland is such a great biking city to host it - and so close to us too! The only dilemna is when we leave as the June 15th is spectacular first real Carfree Vancouver day but the conference starts right after (and the train is infrequent...) That and getting stupid paperwork together for the stupid stupid stupid american border. Anyone else planning to go? I'd recommend it very strongly. The conference registration fee is quite steep but I think there is a low-income option - and it's worth it to be there meeting all that positive energy, thinking and experience. You may have seen this survey already. I filled it out and mentioned the safety on the bridges, the use of bike routes by cars and having bike racks on the roads (like car parking stalls) rather than sidewalks as important priorities. Stop Gateway...write one little letter NOW! Our Environment Minister in BC may be close to signing the environmental certification for the Gateway mega -project. If Barry Penner signs the certification for this project, his legacy would be that of the Environment Minister who gave the green light to the most counter productive and in fact destructive transportation mega-project of our generation! On Minster Penner's website he claims "The BC Government is working to aggressively address global warming and climate change." He even goes on to clearly state "there is still more work to be done if we are to meet our legally-mandated goal of reducing BC's greenhouse gas emissions by 33% by 2020". That he could say this one day and then rubber-stamp what many are calling "the gateway to global warming" is unconscionable. Concerned British Columbian's are writing letters and emails to the Minister of the Environment and the Premier insisting that the environmental assessment not be signed and that genuine consultation take place. This is your chance to have your voice heard and tell Barry Penner and Gordon Campbell to do the right thing. The South Fraser Perimeter Road (SFPR) will harm and maybe kill off Burns Bog, the lungs of the lower mainland our carbon sink! The expansion of Delta port on Roberts Bank has serious impacts on migratory birds such as the Sandpiper that relies on the region to survive as they fly north. Also Port expansion at Delta Port may severally impact Orca Whales whose population in the area are already dwindling. of B.C.s most fertile. The Gateway mega project contradicts the last democratic community planning process that was held around the region, the Livable Region Strategic Plan. Gateway induces car dependent sprawl and starves public transit by monopolizing billions of dollars in public transportation funding. All of this while not examining the impact of rising fuel prices on the feasibility of the project compared to other options. In fact it has recently been un-covered through a freedom of information request that the project managers used the price of $0.80 a litre in their models for studying the project over the length of the contracts which is the next 25 - 40 years! No contracts can be signed until Barry Penner signs the environmental assessment. No meaningful public consultations have yet to be held with the Premier, the Environment Minister or the Transportation Minister. The open houses and community meetings that have taken place have been well orchestrated Public Relation campaigns that were more like focus groups than a genuine attempt to decide the fate of this multi-billion dollar mega -project based on the public will. OUR ELECTED REPRESENTATIVES TAKE YOUR LETTERS SERIOUSLY! They are an indication of where the public will lies...and how people will vote a year from now. Letters are beginning to flow in now at an ever-increasing rate. Your letter can be brief and simply focus on one or two points which concerns you the most. Send an email today! If you would like to stay informed about the campaign to stop "the gateway to global warming" and the campaign to get transit before freeways email gateway@AT@wildernesscommittee-DOT-org with the subject line ADD ME. Forward far and wide, let the joyous news be spread! Callout to ALL citizens, artists, activists, performers, pranksters and funsters Car-Free Vancouver Day is less than two months away !! Sunday June 15th (Fathers Day) will see Car-Free Festivals going off all over the city. We expect 100,000 people to flood the streets to celebrate their neighbourhoods and re-imagine what a more sustainable, ecological, ethical and genuinely cultural city might look like. Other cities around the world are already doing this, and car-free streets are the way of the future. Let's start taking back our streets, NOW! The City is listening, and they are on our side. This is a huge opportunity to show/tell them what we really want: car-free streets, no more highways, and support for authentic urban culture. All four Festivals are all deep into their organizing and have great crews working hard, and we would welcome anyone who wants to get involved in any capacity: organizers, volunteers, performers, anything. Right now we are specifically calling out to all activists, artists, performers, organizations and creative trouble-makers, hoping you will all be coming out and causing a stir. We encourage you to set up soapboxes, banners, art installations large or tiny, info tables, events, performances, games, gifting stations, interactive displays, parades, theatre pieces, interventions pretty much whatever fun you can dream up. It's your party so please do what you like best" we only ask that your activity be respectful (noise and spacewise), and that it be free: free of charge, free of boring corporate stuff, free of cars. There is tons of space for you to express yourself at Car Free Vancouver Day, so please get in touch and let us know what you have in mind. If you're envisioning anything that may require a good chunk of space or a sound system of any sort, please check in with the Fest in question. This is an important courtesy and will help everything run harmoniously. Car Free Vancouver Day isn't it about frickin time?! Check out www.carfreevancouver.org for more. 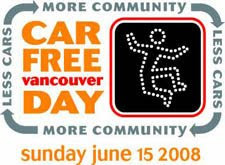 drivefest@carfreevancouver.org or call Craig at 604.320.6560. Interesting news from TO. Sorry I'm to lazy to link to any real Toronto CM info. Please post links in comments if you know any. It's amazing how quick the road was clogged with cars again after being briefly opened up to people. It's very important that we think about our language and the habits of tacitly accepting car culture. For instance remember to describe the upcoming Car-Free Vancouver festival as an Opening Up of the Street (which is more accurate as it describes more people than normal using a street and in more interesting ways) rather than the normal term: Street Closure which presumes that car use is the only possible way to use a public road. Check out the ending humour: "confirmed the ride was organized by Critical Mass" ... "CM’s message" ... "get attention" Obviously, Sunny Freeman can't do basic web research to find out what Critical Mass is. Quoting someone on Facebook who doesn't understand either doesn't count as research. I wonder what could be CM’s message seperate from its methods? A group of cyclists cruises down the westbound lanes of the Gardiner Expressway, Friday, May 30, 2008. About 200 cyclists, some riding with children, shut down the westbound lanes of the Gardiner Expressway last night in what police called a dangerous stunt. The Gardiner was shut down for almost half an hour when the cyclists, most of whom were wearing helmets, stormed onto the westbound lanes from Lower Jarvis St. around 7:30 p.m., said Traffic Services Sgt. Jeff Redden. The cyclists pedaled down the expressway for about 20 minutes and seven kilometres before being rounded up by police cruisers and directed toward the off-ramp at Dunn Ave, said Redden. There were no collisions or injuries, but traffic was stalled as the bikers took up all westbound lanes and refused to leave, Redden said. Some cyclists dismounted their bikes and climbed over a wall onto CN railway tracks to escape police, said Redden. Redden said it did not appear to be an organized protest, but that several cyclists had placards demanding a bike lane along Bloor St. He believes it was related to the Critical Mass bike ride, which meets on the last Friday of every month. Four cyclists who refused to leave the highway were arrested and charged under the Provincial Offences Act with cycling on a highway. Redden said some of the cyclists dismounted their bikes, thrust them above their heads and ran at the officers. Police had released everyone and traffic was moving slowly by around 8:30 p.m., about an hour after cyclists flooded the ramps. Redden said there was no indication cyclists from the Toronto Criterium bike race happening nearby, were involved. Yvonne Bambrick, of the Toronto Cyclists Union said she had no idea the event was occurring. A Facebook group for the Toronto chapter of Critical Mass was abuzz today with posts about the controversial stunt. Tory Law, 21 year-old cyclist and member of the group, confirmed the ride was organized by Critical Mass.